White Deer, Pennsylvania: Proposed tire incinerator stopped by grassroots leaders with Organizations United for the Environment and the Tire Burner Team who we've supported since 2011. 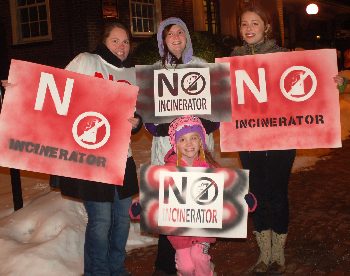 Minneapolis, Minnesota: Trash incinerator expansion blocked by grassroots activists we've supported. North Springfield, Vermont: large biomass incinerator stopped by North Springfield Action Group, a grassroots group we helped launch an opposition campaign. Bristol Township, Pennsylvania: Proposed hazardous waste incinerator stopped after we've testified to expose corporate misinformation, and supported grassroots and political opponents who reached out to us in late 2013. North Las Vegas, Nevada: gigantic plan for a construction and demolition gasification incinerator stopped by our biomass network members, Citizens of North Las Vegas United. Port Townsend, Washington: paper mill's plan for a biomass incinerator stopped by our biomass network members, Port Townsend Air Watchers and No Biomass Burn. Jasper, Indiana: biomass incinerator to burn Miscanthus grass stopped by our biomass network members, Healthy Dubois County. Newark, Delaware: a natural gas power plant (disguised as a data center at the University of Delaware) was stopped by the Newark Residents Against the Power Plant group we helped train. Lorton, Virginia: a construction/demolition waste landfill expansion was defeated by the Citizens to Stop the Dump and South County Federation. We helped a bit, going door-to-door in the community that is also overshadowed by the 4th largest trash incinerator and surrounded by two other landfills. We brought in experts on zero waste to speak about alternatives for recycling those valuable materials. Maryland: Working with the Zero Waste Maryland coalition and other allies, we helped stop legislation, for a second year in a row, that would have put Maryland on the path to burning nearly all of its waste that is not recycled. Also, commented on several other compromised energy bills, none of which passed. Washington, DC: Washington, DC city government passed two major waste laws we worked on, banning Styrofoam, instituting curbside composting, requiring the city to adopt a zero waste plan, starting electronic waste recycling and much more to move the nation's capitol toward zero waste! Later this year, we hope and expect to see victories in other communities we've been supporting, including against incinerators planned in Allentown, PA, Arecibo, Puerto Rico, Baltimore, MD, Crawford County, PA, Frederick, MD, and Logansport, IN. We also are hopeful to see victories against a New York City trash-by-train plan to feed the nation's largest incinerator, in Chester, PA, and a proposed landfill in Waller County, TX.